The new ‘pupil premium plus’ will see funding to support children in care at school increase by £1,000 per pupil. Children will be covered as soon as they enter care and 10,000 more children in care will benefit, bringing the total to 50,000. Children in care have previously attracted pupil premium funding at the same rate as children from low-income families, but in future they will attract a higher rate of funding – the pupil premium plus. From April next year, children in care will attract £1,900 additional funding per pupil, more than double the £900 awarded in 2013 to 2014. In addition, this support will now reach more children. At the moment, children in care attract the pupil premium if they have been looked after for 6 months or more, but in future they will be funded from their first day in care. Total funding will increase from £40 million in 2013 to 2014 to £100 million in 2014 to 2015. Children in care face unique challenges at school and often struggle to keep up with their peers at both primary and secondary level. It’s vital that these vulnerable children are given the targeted support they need and the education they deserve to help them get on in life. I’m delighted to announce that we’re more than doubling funding to support the education of children in care whilst at school and that from next year they will receive this extra support from the moment they enter care. Through the Children and Families Bill, the government is also making it mandatory for every council to have a ‘virtual school head’ – an individual who champions the education of children in care and acts as their overarching head. Today’s announcement includes plans to extend the role of the virtual school head to work with schools to manage the pupil premium plus and ensure that the money is spent on securing the best educational support and services for children in care. For example, this could include specialist tuition for musically gifted children or one-to-one catch-up sessions. For the first time, children adopted from care and those who leave care under a special guardianship order or residence order will also attract the pupil premium plus. In 2011, the government introduced the pupil premium. This gives schools extra funding to raise attainment for disadvantaged pupils and close the attainment gaps between the most disadvantaged pupils and their peers. Children from low-income families and children who have been looked after for 6 months or more attract the pupil premium, worth £900 per pupil in 2013 to 2014. Today ministers are announcing that children in care will, in future, attract a higher rate of pupil premium funding – the ‘pupil premium plus’. In 2014 to 2015, this will be worth £1,900 per child per year. Ministers are also announcing today that, from April 2014, children in care will be funded from the first day of care. For the first time, children adopted from care and those who leave care under a special guardianship order or residence order will also attract the pupil premium plus. 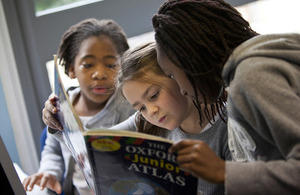 The latest statistics on education outcomes for looked-after children were published in December 2012. The government is making it a legal requirement for all councils to have a virtual school head through the Children and Families Bill. Local authorities that already have strong virtual school head arrangements in place achieve above the national average for looked-after children. For example, in 2012, 40% of looked-after children in Warrington achieved 5 good GCSEs including English and maths, alongside 37.5% in North Tyneside and 22.2% in Dudley. Over the coming months, we will work with virtual school heads and schools to determine how the virtual school head can help schools use the pupil premium to best effect.